By TLex Introducing the new Engineer Hydrocarbon Black, the first BALL EH model to use a DLC (Diamond-Like Carbon) coating. I'm hoping the DeepQUEST will be the next one! 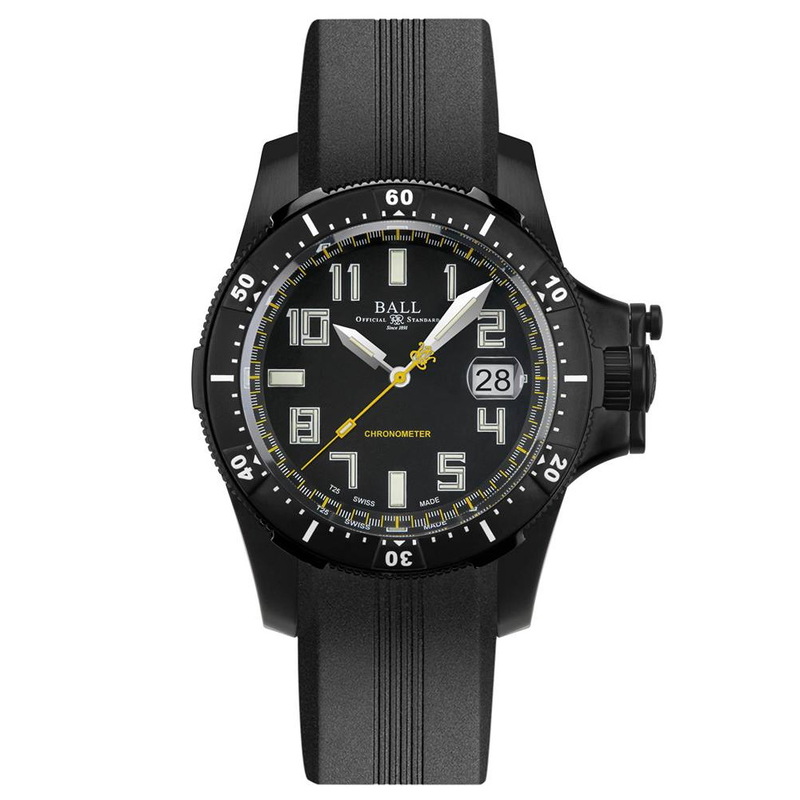 In fact BALL Watch was one of the first watch brands to use DLC, which offers exceptional scratch resistance and increased durability. It looks pretty sleek, too! Its 42mm (diameter) x 13.25mm (thick), Titanium case has a water-resistance of 300m/1,000ft. 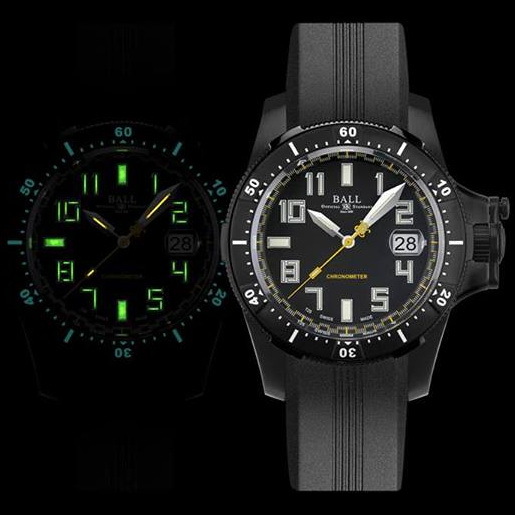 It is fitted a 5.3mm thick (anti-reflective treated) Sapphire crystal and a black ceramic unidirectional rotational divers bezel that uses BALL’s pioneering luminescent application process for the elapsed dive-time scale, allowing instant readings in the dark. Like the DLC coating, the ceramic bezel offers exceptional scratch and corrosion resistance. 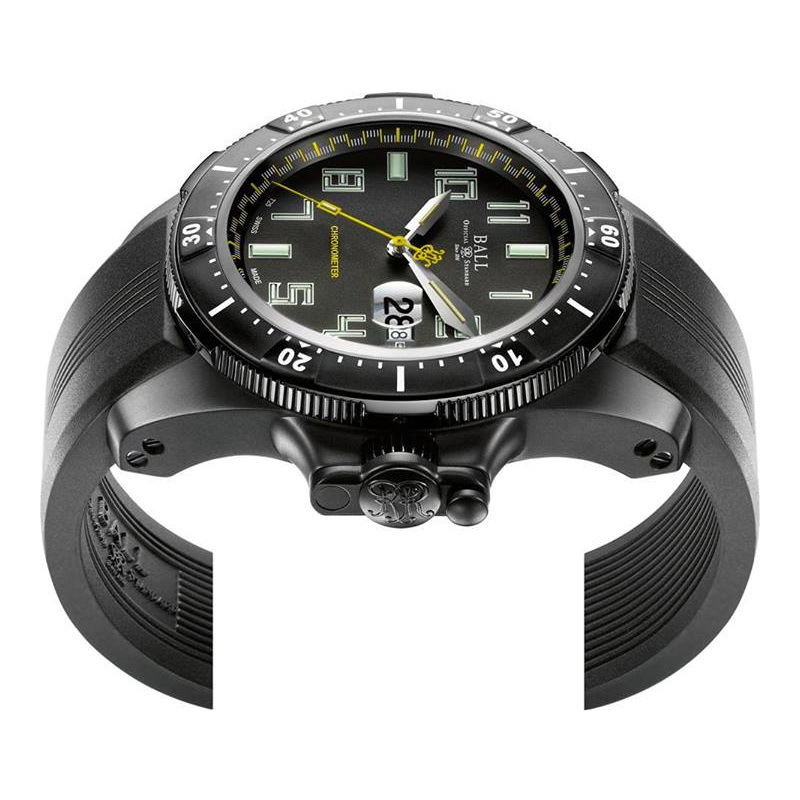 The case is also equipped with BALL’s new (updated) patented SpringLOCK® system. Exclusively developed by BALL, the mechanism guarantees the movement’s working accuracy by providing the balance spring with a real ‘cage’ to absorb the energy of external shocks to the watch. Apparently such an event could cause a standard mechanical movement to go out by up to (more or less) 60 seconds per day. The SpringLOCK® safeguards the accuracy of the movement by reducing the impact of external shocks up to 66%! 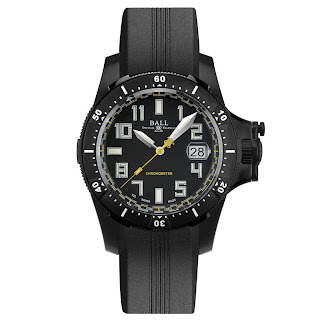 The Engineer Hydrocarbon Black is powered by an automatic ETA 2892-A2, chronometer certified C.O.S.C. movement. Its accuracy has been tested by the Swiss Official Chronometer Testing Institute. In addition to the basic time display, there is a date aperture with a Cyclops (magnifier) at 3 o'clock. The movement is further protected from magnetic fields up to 4,800A/m. The black dial has outstanding legibility thanks to the use of micro tubes containing luminescent 3H gas – these form the Arabic numerals marking the hours. 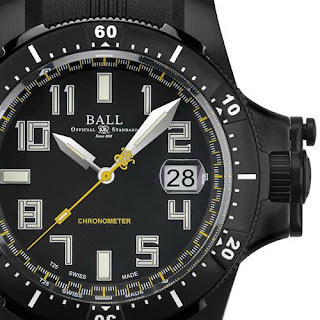 This design element (patented by BALL) uses state-of-the-art Swiss luminescent technology for reading the time by day or night. Micro gas tubes provide light intensity up to 100 times more effectively than conventional lume and require no external light source or energy.